If you liked this show, you should follow Ra Sekhi Radio. Part of our liberation is financial and the ability to provide for self and others. More and more people, and African American women in particular, are choosing the path of entrepreneurship. 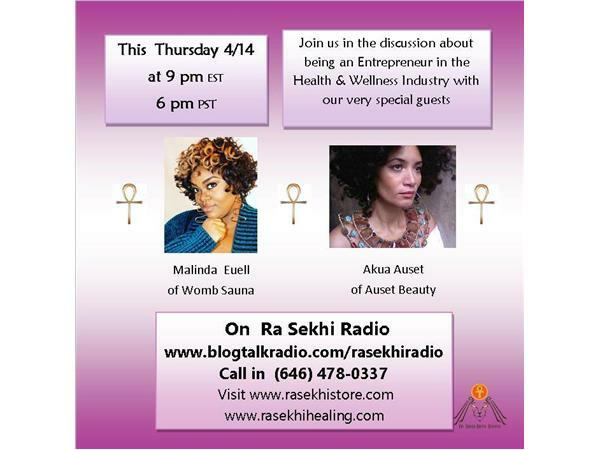 We have two special guests, Malinda Euell of Womb Sauna and Akua Auset of Auset Beauty this week to share with us their perspective about their chosen paths and experiences. The Health and Wellness Industry is continuously increasing at an accelerating rate. We welcome you to listen in and join us in the discussion the challenges, benefits, and opportunities of entrepreneurship particularly in the Health and Wellness Industry.